Background and objectives: Standard treatment for lupus nephritis, including corticosteroids and cyclophosphamide, is efficient but is still associated with refractory or relapsing disease, or severe deleterious effects. Rituximab, a monoclonal chimeric anti-B cell antibody, is increasingly used in patients with lupus nephritis, but reported series were small and had a short follow-up. 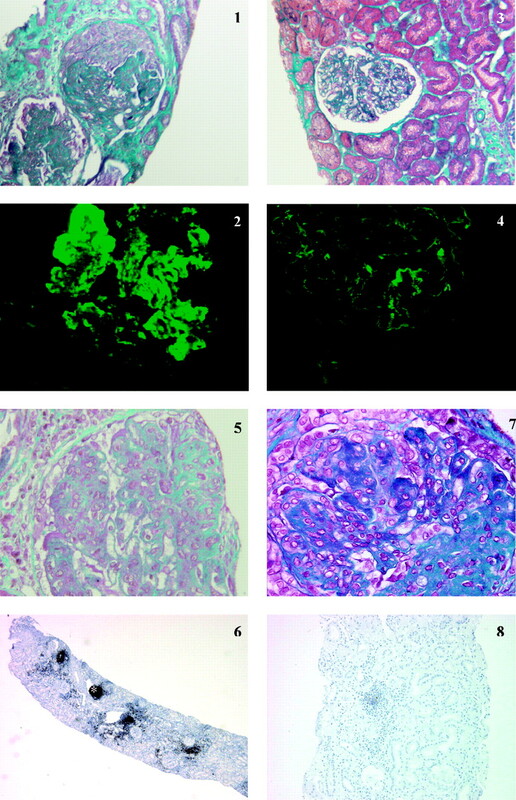 Design, setting, participants, & measurements: The authors analyzed clinical and histologic data of 20 patients who were treated with rituximab for lupus nephritis and followed up for at least 12 mo. Results: Nineteen women and one man received rituximab as induction treatment for an active class IV (15 cases) or class V (5 cases) lupus nephritis. Rituximab was given for lupus nephritis refractory to standard treatment (12 cases), for relapsing disease (6 cases), or as first-line treatment (2 cases). Three patients received cyclophosphamide concomitantly with rituximab. Ten received new injections of rituximab as maintenance therapy. Side effects included mainly five infections and four moderate neutropenias. After a median follow-up of 22 mo, complete or partial renal remission was obtained in 12 patients (60%). Lupus nephritis relapsed in one patient, who responded to a new course of rituximab. The achievement of B cell depletion 1 mo after rituximab, which negatively correlated with black ethnicity and hypoalbuminemia, was strongly associated with renal response. Rapidly progressive glomerulonephritis did not respond to rituximab. Conclusion: Rituximab is an interesting therapeutic option in relapsing or refractory lupus nephritis when early B cell depletion is obtained. Systemic lupus erythematosus (SLE) is an autoimmune disease with polymorphic expression. One of its most severe manifestations is lupus nephritis (LN) which is associated with an increased morbidity and mortality. The standard treatment for active proliferative LN (class III and IV) includes corticosteroids (CS) and cyclophosphamide (CYP). This regimen has been shown to be more efficient than CS alone (1), and the prognosis of LN has greatly improved in the last decades (2). Nevertheless, the occurrence of resistant or relapsing LN (respectively 20% and 33% after first-line treatment; 2), as well as the high frequency of deleterious effects of CYP and CS, make the use of alternative treatments necessary. In membranous LN, there is no generally admitted standard treatment, and the development of effective therapeutic regimens with little toxicity is needed in patients with persistent severe nephrotic syndrome (3). Mycophenolate mofetil (MMF) seems to be a promising treatment in both proliferative and membranous LN, but long-term data on efficacy are still lacking (4). Although the pathogenesis of SLE remains not fully understood, hyperreactive B cells seem to play a central role through the production of auto-antibodies, antigen processing and presentation, recruitment of auto-reactive T cells, interaction with antigen presenting cells, and secretion of cytokines (reviewed in (5). Targeting B cells could therefore be an interesting therapeutic option in SLE, especially LN. Rituximab (RTX), a monoclonal chimeric antibody directed against CD20, induces a profound and long-lasting B cell depletion. It was initially successfully developed for the treatment of non-Hodgkin lymphoma (6), and subsequently used in various auto-immune diseases, including SLE (7). Few open studies have evaluated the use of RTX in SLE patients. Overall, results were encouraging. However, these series included a small number of patients with active and/or severe LN and long-term data regarding the outcome of patients with LN treated with RTX are extremely scarce. Our multicenter study aimed to assess long-term (≥12 mo) efficacy and safety of RTX in 20 SLE patients with severe proliferative or membranous LN. We identified retrospectively twenty patients in eight French nephrology centers treated with RTX for LN between October 2003 and December 2006. Inclusion criteria were: 1) diagnosis of SLE according to the American College of Rheumatology (ACR) (8); 2) available follow-up ≥12 mo; 3) active class III or IV, or class V LN established by kidney biopsy performed less than 3 mo before RTX initiation (in the absence of contra-indication). Medical files were reviewed and relevant clinical and biologic data were recorded. GFR (eGFR) was estimated according to the simplified Modification of Diet in Renal Disease Study equation (9). Circulating B cells level in the peripheral blood were evaluated by the detection of CD19+ cells by flow cytometry. B cell depletion was defined as a CD19+ cell count ≤5/mm3 and ≤1% total lymphocytes count. Assay for RTX-specific human antichimeric antibodies (HACAs) was performed as described previously (10). Positivity threshold for HACAs is 20%. All kidney biopsy specimens were blindly reviewed by two expert pathologists (LH Noël and I. Brocheriou), and graded according to the International Society of Nephrology/Renal Pathology Society 2003 classification (11). Renal insufficiency is defined as an eGFR <60 ml/min/1.73 m2. Partial renal remission (PR) was defined as a decrease in 24 h proteinuria >50%, and stabilization of eGFR. Complete renal remission (CR) was defined as 24 h proteinuria level <0.5g/d, absence of hematuria and a normal eGFR (≥60 ml/min/1.73 m2) or an improvement of eGFR >50% from baseline value. Results are expressed as frequencies and percentages for categorical variables and as medians (range) for continuous variables. Differences between groups for categorical variables were tested using the Fisher's exact test, and differences between groups for continuous variables were tested using the Wilcoxon rank sum test. Comparison of corticosteroid dosage before and after treatment was analyzed by paired Wilcoxon signed rank test with continuity correction. P values smaller than 0.05 were considered as statistically significant. Statistical analyses were performed with the R software (http://www.R-project.org). Twenty patients (19 women and one man) were included in the study. Clinical and biologic characteristics are shown in Tables 1 and 2. Three patients (pts 2, 6, and 9) have already been reported elsewhere (12). Twelve patients had already experienced at least one LN relapse, including seven patients with at least two LN relapses. Eighteen patients (90%) had already received at least one line of IS therapy, including intravenous CYP in 15 patients, with a median cumulative dose of 6 g (3–12). Upon RTX initiation, renal involvement was severe as nephrotic syndrome was present in 18 patients and acute renal insufficiency in 9, among whom three had an eGFR <15 ml/min/1.73 m2 (Table 2). Three patients did not undergo kidney biopsy in the 3 mo before RTX because of temporary contra-indication: severe thrombocytopenia in patients 13 and 16; anti-vitamin K treatment in patient 15. For these patients, the most recent kidney biopsy (5 yr, 1.5 yr and 2.5 yr before RTX for patients 13, 15 and 16 respectively) showed a class V LN. In this type of LN, kidney biopsy is not mandatory before the start of IS in case of persisting severe nephrotic syndrome. Kidney biopsy disclosed class IV LN in 15 patients (including four with class IV+V), and class V in five patients (Table 2). RTX was administrated weekly for 4 wk at a dosage of 375 mg/m2 of body surface area, except for patients 8 and 9 who received three injections. Treatment associated with RTX varied (Table 2). Three patients had received CYP less than 3 mo before study entry, and three others received CYP concomitantly with RTX. Ten patients received RTX as a maintenance therapy (number of RTX injections: one to 11; median: 2). Retreatment with RTX was decided because of increase of B cell count >5/mm3 mainly in patients in whom all previous treatments including CYP and/or MMF had failed to induce long-term remission. RTX maintenance therapy was associated in four cases out of 10 with another immunosuppressive therapy (MMF in patients 13, 18 and 19 and AZA in patient 15). After a median follow-up of 22 mo (range 10 to 51), complete (CR) and partial (PR) renal remission were obtained in seven and 5 patients respectively, corresponding to an overall renal response of 60%. CR or PR occurred early (less than 6 mo) in six patients (pts 3, 6, 12, 15 19 and 20), at 12 mo in 5 patients (pts 5, 7, 9, 17 and 18) and at 26 mo in patient 2. Among the 15 class IV LN patients, 66% responded to RTX, including 5 CR and 5 PR. Only one of the responders relapsed during follow-up: patient 18 reached PR at M3 and relapsed at M9. She subsequently received two injections of RTX and achieved PR. Among the 5 treatment failures, four underwent chronic hemodialysis. None of the three patients who initially presented with RPGN responded to treatment. Patients 10 and 11 presented with acute renal failure as a result of RPGN and were started on hemodialysis at the same time as they received CS, CYP and RTX. Hemodialysis could not be discontinued. Patient 8 had less severe RPGN. Lack of response 45 d after the last infusion of CYP urged the physician to prescribe RTX. She failed to respond and was started on hemodialysis 6 mo after RTX initiation. Two of the five patients treated with RTX for class V LN reached CR, with no relapse at last follow-up. Patient 13 did not respond to RTX. She had not had a recent kidney biopsy before treatment. One can not exclude that chronic lesions (i.e. secondary focal segmental glomerulosclerosis) may have hampered renal response. Patient 16 did not respond to RTX, evolved to class III+V LN on control kidney biopsy and died at M10. Absence of renal remission was significantly associated with black ethnicity (black patients: 75% among nonresponders versus 8% among responders, P = 0.004) (Table 3) and with the absence of B cell depletion one month after RTX initiation (B cell depletion at M1: 11/11 among responders versus 1/6 among nonresponders; P < 0.001). Of note, in two patients (pts 1 and 14), B cell depletion was not achieved until M3. Neither of them responded to treatment, suggesting the importance of early B cell depletion. Repeated kidney biopsy was performed in nine patients, who were either in partial remission or not responding, to guide further treatment. In all, median histologic activity decreased from 9/24 (0 to 11) to 2.5/24 (0 to 8). In 5 responders (3 CR, two PR) with baseline class IV LN, repeated kidney biopsy confirmed clinical response by showing a decrease in activity index (Table 2 and Figure 1). Immunohistochemistry for CD20+ cells was available in patient 4 (Figure 1). This patient presented with severe class IV LN refractory to treatment associating CYP and CS, followed by MMF. Renal biopsy performed before RTX initiation showed massive interstitial infiltrate with a majority of CD20+ cells. Peripheral B cell depletion was not obtained, and the patient's renal function continued to deteriorate. Very surprisingly, a control renal biopsy performed 2 mo later showed complete resolution of the B cell inflammatory infiltrate, even though glomerular lesions had significantly progressed. Treatment was efficient on hematologic manifestations of SLE. Auto-immune hemolytic anemia in patients 10 and 11, and thrombotic microangiopathy in patient 12 resolved after RTX. Overall, among the twelve patients who had hematologic disorders at inclusion, only six still did at the end of follow-up. Treatment enabled significant CS sparing as the median dose of oral CS decreased from 0.7 mg/kg per d (0 to 1.5) to 0.1 mg/kg per d (0 to 0.5) (P < 0001). In responders, the decrease in median CS was important, going from 1 mg/kg per d (0 to 1.2) to 0.1 mg/kg per d (0 to 0.4), whereas in patients who did not respond to treatment and did not require hemodialysis it decreased only from 0.6 mg/kg per d (0.2 to 1.5) to 0.3 mg/kg per d (0.1 to 0.5). B cell depletion at M1 was obtained in 12 of 17 patients. Duration of B cell depletion was available for 11 patients and ranged from 3 to 12 mo (median 6 mo). Depletion failure was significantly associated with black ethnicity (80% versus 17%; P = 0.03) and with hypoalbuminemia (18 ± 6g/L versus 26 ± 5g/L; P = 0.02) (Table 4). Assay for HACA, available for nine patients (Pts 2, 4, 6, 8, 9, 13, 15 to 17), was positive in two patients (patients 8 and 16), both of whom were of African origin, had deep hypoalbuminemia, failed to reach B cell depletion, and had a pejorative outcome. The population is too small to reach statistical significance, but there could be an association between HACA and B cell depletion failure and/or absence of clinical response. As illustrated in Figure 2, patient 16 had at baseline a peculiar population of CD19+CD20- B cells. She failed to reach CD19+ B cell depletion after RTX therapy. Subsequently, HACAs were detected. Because of renal disease deterioration, she was treated with intravenous CYP at M3. 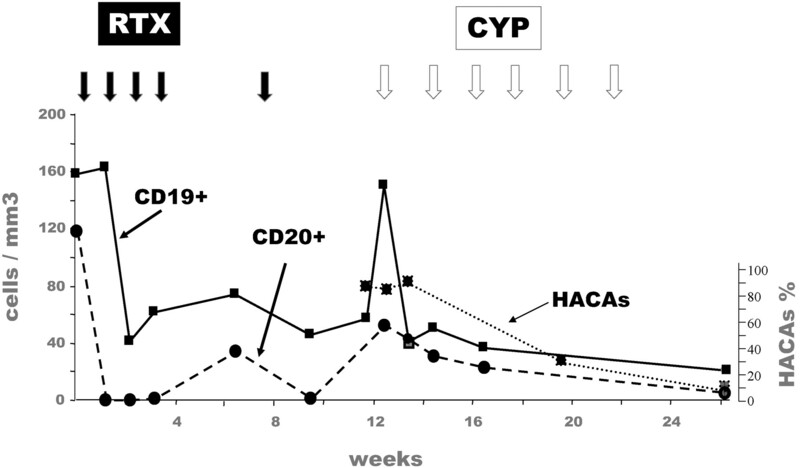 CYP was followed by a disappearance of HACAs and a depletion of CD19+ cells 3 mo after the first CYP injection. Patient 16: Evolution of CD19+ and CD20+ cells, and of rituximab-specific human antichimeric antibodies (HACAs) after treatment with rituximab (RTX) and cyclophosphamide (CYP). Full arrows: injection of RTX (375 mg/m2 of body surface area). Empty arrows: injection of CYP (500 mg). Anti-Double Stranded DNA Antibodies (anti-dsDNA Ab) and Complement Levels. Disappearance of anti-dsDNA Ab was obtained in seven of 17 patients. It was not associated either with B cell depletion or with clinical response to treatment. Complement levels normalized in all patients for whom they were initially low, except for patients 4, 8 and 16. There was no association between initial complement levels and either B cell depletion or renal outcome. RTX injection was overall well tolerated, with two patients experiencing headache (patients 8 and 17), and one nausea (patient 13). Five patients had infections during follow-up, including two serious events in hemodialysed patients (septic shock and septic arthritis in patients 10 and 11, respectively). The other three patients had viral infections: oropharyngitis while on RTX therapy in patient 6, cutaneous herpes zoster virus in patients 7 and 12 who were taking azathioprine and mycophenolate mofetil respectively at the time. Patients 8 and 16 experienced posterior reversible encephalopathy syndrome (PRES) during follow-up. Both failed to respond to RTX and had several risk factors for PRES: active SLE, hypertension, hypervolemia, and/or treatment with high-dose CS. Both evolved favorably with antihypertensive drugs. Subsequently, patient 16 died at M10 from massive cerebral hemorrhage, in a context of incompletely controlled SLE and hypertension. RTX is increasingly used in LN. Even though several series have been reported (13–23), limitations preclude reliable conclusions regarding the use of RTX in LN. The largest series (20) included 21 LN, but the only details on renal outcome consisted of a “decrease of median urinary protein creatinine ratio from 446 to 190 mg/mmol at 6 mo, even though this was not statistically significant (P = 0.06).” In the series with the longest follow-up (15) (24 mo), there was no information regarding kidney biopsy, and none of the patients had baseline renal insufficiency. To our knowledge, the only study that reported recent kidney biopsy data before treatment and repeated kidney biopsy during follow-up was published by Gunnarson et al. (17). Even though very instructive, this study had a short follow-up (6 mo) and included only seven patients, with only one with renal insufficiency. Altogether, only 14 cases of adults treated with RTX for LN and kidney insufficiency have been reported so far. However, patients had a mild kidney insufficiency (eGFR between 40 and 60 ml/mn) and a short follow-up in nine cases (13,17,23). Compared with these studies, our report included one of the largest numbers of patients and had one of the longest follow-up. Furthermore, our study included many patients with severe disease: nine patients had kidney insufficiency including three RPGN, one-third were of black ethnicity and most had refractory or relapsing disease, despite high-dose conventional treatment. Therefore, our study provides valuable information regarding RTX efficacy in patients with severe LN. Our study is not controlled, but it is highly unlikely that patients with severe LN and renal insufficiency may be included in randomized controlled trials. Overall, RTX, associated with CS and/or other IS therapies, showed efficacy in LN in 60% of our patients. This figure is comparable to what was observed in the other studies cited above including LN patients treated with RTX (response rate ranging from 33 to 57% cases). Considering that response to first-line treatment is 81% at the very best (2), 60% response in severe LN seems quite promising. Being able to identify the patients who will benefit from such a treatment is an important challenge. In our study, we found a strong association between B cell depletion at M1 and treatment success. Indeed, only one patient in whom B cell depletion was obtained did not have a positive renal outcome, and the achievement of B cell depletion is associated in our study with a high probability of renal remission (92%). Even though these data need to be confirmed, B cell depletion failure at M1 should urge clinicians to use another IS therapy. Even though B cell depletion is an early predictor of renal response, it would be interesting to predict in which patients it will be obtained before choosing RTX treatment. It is not as yet fully understood why B cell depletion failure is more frequent in SLE (up to 35% (14)) than in other conditions during which RTX is used (close to 0% in rheumatoid arthritis (24)). Our study, and others, open some leads. We found that deep hypoalbuminemia, black ethnicity, and possibly HACAs, were associated with depletion failure. Association between black ethnicity and B cell depletion failure in SLE was shown by Looney et al. in 2004 (14). However, in a more recent study by Albert et al. (19), such an association was not found. To our knowledge, no link between treatment efficacy and ethnicity was found in other indications of RTX. This possible association between black ethnicity and B cell depletion failure could be explained by peculiar characteristics of B cells in this ethnic group. FcγRIIIa polymorphism is a possible explanation for variability in response of SLE to RTX (25). In our study, FcγRIIIa genotyping was not available. However, the FcγRIIIa-158F allele, possibly associated to B cell depletion failure, does not seem to be more frequent in African than in Caucasian population (26), suggesting other unrecognized black ethnicity-associated B cell resistance factors. Given the fact that one of the potential mechanisms of action of RTX is complement-mediated cytotoxicity (27), we hypothesized that complement consumption in LN could account for B cell depletion failure. However, we found no association between C3 or C4 levels and B cell depletion. Baseline hypoalbuminemia was also found to be associated with B cell depletion failure. To our knowledge, no other study has searched for such an association. In a study of idiopathic membranous nephropathy patients treated with RTX, Fervenza et al. (28) showed an association between high rate proteinuria and B cell depletion failure, suggesting a urinary loss of RTX (no data were available regarding albuminemia). This is probably not the case in our study as we found no link between proteinuria level and B cell depletion. We hypothesize that hypoalbuminemia may reflect the activity of LN, and therefore be associated with higher resistance to RTX. Finally, as previously reported (14,19), we found a tendency to an association between HACAs and B cell depletion failure. However, occurrence of HACAs could be the consequence of inadequate immunosuppression and B cell abnormal features, and not the cause of B cell depletion failure, as HACAs are not associated with absence of response to RTX in lymphoma (27). In our study, patients who received CYP concomitantly with RTX did not have a better outcome compared with patients treated with RTX alone. It remains unknown whether adding CYP to RTX may reduce the risk of occurrence of HACAs. To our knowledge, only 5 patients with RPGN treated with RTX have been reported so far, in an abstract (29). Similarly to our three patients, none of those patients responded to an association of RTX, CYP and CS, even though B cell depletion was obtained in four of them. The fact that RTX seems to have delayed efficacy (12 mo or later in half of our patients) could account for its failure in RPGN. Data regarding RTX maintenance therapy are still very scarce. In our study, RTX maintenance therapy seems to be a satisfactory therapeutic regimen, enabling long-term remission (more than 4 yr in two patients) with little side effect. Mechanism of action of RTX in LN is not fully understood. Similarly to previous studies, we found no particular effect of RTX on anti-dsDNA Ab levels. This result suggests that RTX works not solely (or not at all) through auto-antibody depletion but most likely by modulating the complex role of B cells on the immune system, including the B cell/T cell crosstalk. RTX could be an interesting option in refractory or relapsing LN, excluding RPGN. B cell depletion at M1 is a useful and early predictor of response. Black ethnicity and profound hypoalbuminemia are probably associated with poor outcome. Prospective studies assessing the efficiency of RTX, with or without CYP, in severe LN are warranted.